Ron was the first ever Norn-- a very smart pre-release Norn that was created in order to demonstrate the Creatures prototype (then known as Small Furry Creatures) to Ron Rivkin, a producer from American Software Corp.
Steve Grand once wrote an article entitled "I am Ron's Brain", presumably named after the Reader's Digest article he mentions in one of his books. Data also made him a norndoll called Ron (who has met Steve's Lucy). The Ron Norns are also a breed contained in the Life Kit for Creatures and Creatures Deluxe, and were converted for Creatures 3/Docking Station in C12DS. 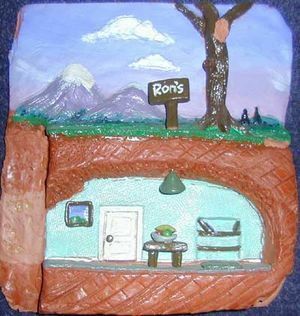 Ron's House is a metaroom for DS that was created using Ron's plaster-of-Paris burrow for the graphics. This page was last modified on 14 August 2016, at 03:15.